Mario Sports Mix was released on February 7, 2011 in North America, with a MSRP of $49.99. The game was developed by Square Enix and published by Nintendo. The ESRB gave the game an "E for Everybody" rating, with "Mild Cartoon Violence" being the only content listed for parents to be aware of. 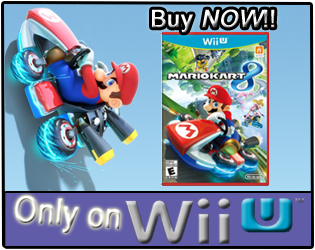 A portion of the game's Amazon.com description reads , "Mario Sports Mix is a fast-paced and fun sports game for Wii featuring all your favorite Nintendo characters in over-the-top Mushroom Kingdom athletic action. Events included in the game include basketball, volleyball, dodgeball and hockey playable both on ice and elsewhere. Additional features include: multiplayer support, including four-player co-op play and two-on-two competitive play; special devastating moves available for each character; the ability to use koopa shells and other means against opposing players; a variety of game environments and more." How many hours have Wii owners spent playing basketball, volleyball, dodgeball, and hockey in Mario's Mushroom Kingdom, with 22 days reported? Let's take a look! 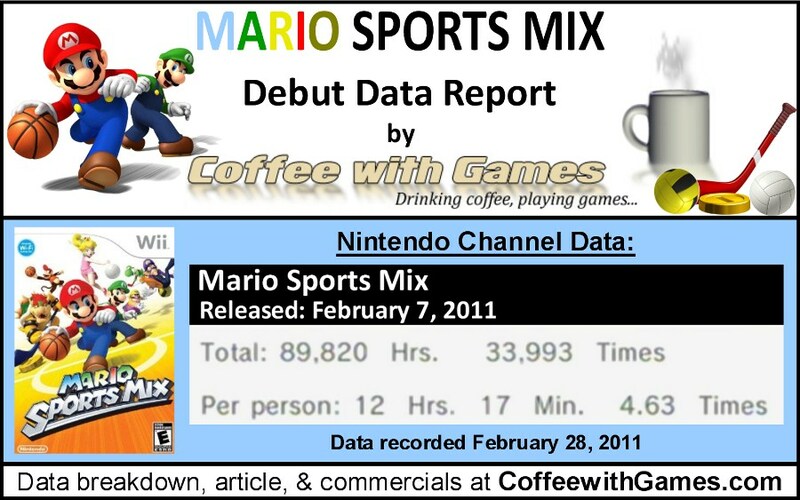 Mario Sports Mix has 7,341 Wii owners reporting their game-play data through the Nintendo Channel, on its debut. 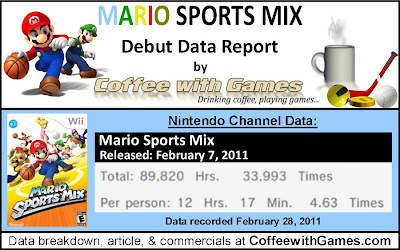 Mario Sports Mix has 89,820 Total Hours of game-play reported on its debut, with an average "sports" play-time of 12 Hours 17 Minutes "Per person"(or console) reporting data. The game's average play-time per session is just over 2 Hours 39 Minutes. Mario Sports Mix's "professional" review score average is 64.69%, based on 26 reviews on GameRankings.com. I haven't played Mario Sports Mix, and I probably won't play (or buy) it anytime soon, though I am interested to see how hockey plays in the game. I really enjoyed Mario Strikers Charged, because it reminded me a lot of the NHL Hitz hockey games I used to play. If the hockey game in Mario Sports Mix plays like either Mario Strikers Charged or the NHL Hitz games, I would probably enjoy that sport the most. As for the game's debut game-play hours, they actually took one week longer to debut than I expected for this game, considering it's a Nintendo published title with the name "Mario" in its title. The debut hours are pretty solid for a game initially debuting though, and I think it will be interesting to see how the game performs over the next few months considering it has online multi-player, as well as local multi-player. I guess with March Madness almost upon us, Nintendo's release of Mario Sports Mix in North America was well timed for basketball fans, that are perhaps also Mario fans. 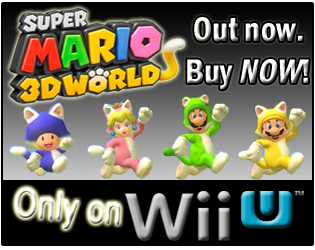 It's like Nintendo basketball fans can have a "Mario March Madness" in the Mushroom Kingdom with Mario Sports Mix! If you have played Mario Sports Mix, do you think the game is closer to an 85% review score like the customer reviews, or do you think it's closer to the 64.69% "professional" review score average? Also, if you played the NHL Hitz hockey games, how does hockey in Mario Sports Mix play compared them if you can remember? I gave Mario Sports Mix an 8.25 out of 10. I do not agree with the press who probably played the normal difficulty and didn't bother with the meat of the game. I don't bother with mainstream reviews anymore. It's just not interesting to me.